A proposed ‘Member’s Bill’ from the Scottish Greens’ environment spokesperson, Mark Ruskell MSP, would see the current 30mph default speed limit on restricted roads reduced to 20mph. Mr Ruskell, who has cross-party support, says the move would lead to fewer severe and fatal road casualties, encourage more people to walk and cycle, and cut air pollution. He added that introducing a national 20mph speed limit would cost £4.3m in signage – compared to £17.2m if every local authority rolled out their own Edinburgh-style 20mph zones individually. 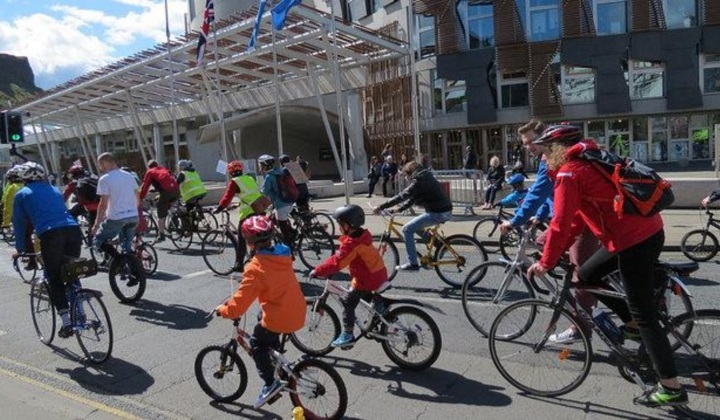 Alongside other Green Party MSPs, Mr Ruskell took part in ‘Pedal on Parliament’ on 28 April – an event organised to highlight the need for ‘safer streets with lower speed limits, and investment in cycling and walking routes to prevent ill-health’. 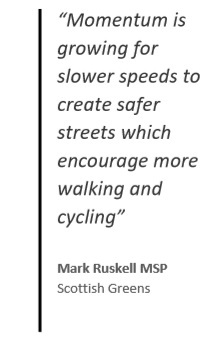 Mr Ruskell said: “Momentum is growing for slower speeds to create safer streets which encourage more walking and cycling. “Along with public support, and that of the leaders of Scotland’s two biggest city councils, we have support from the OECD and the World Health Organisation for 20 mph to become the appropriate speed limit where walkers, cyclists and motor vehicles mix. Alison Johnstone MSP, health spokesperson for the Scottish Greens, said: “The seventh consecutive Pedal on Parliament is a reminder that our streets are there for all of us – whether travelling on foot, by bike, by wheelchair, or mobility scooter. “I’ve been demanding more money for walking and cycling routes for many years and the budget Green MSPs negotiated with the Scottish Government this year doubled the funding available. “Investing in walking and cycling has to be at the core of any preventative health agenda, as we have long known that spending more time being active is key to preventing Type 2 diabetes, for example. The emissions argument and science of 20mph v 30mph are rather diminished when new 20mph speed limits often claim success if average speeds drop by as little as 2mph. Calculations based on 10mph reductions are mostly pipe dreams. Certain car makers new diesels models are many times more polluting than other car makers in real world driving experiences – as independently tested by industry (and Which?) and truly unbiased. High performance versions of petrol cars can still be vastly more polluting than their ‘fig leaf’ eco petrol versions of the same models. Don’t forget about CO2 emissions where petrol is still the bad boy. As previously stated, just take emissions out of the 20s v 30s argument as there are so many variables that generalisations become meaningless. …and I enjoy walking the dog an hour a day after I have driven to/from work. I was tryng to add some rigour to the thoughts about emission use. Peter De Nayor (former AA fuel efficiency expert) did some tests on steady state 20mph vs 30mph and found very similar fuel consumption. Plus or minus 10% dependent on the gearing. But for some cars 20mph was the most efficient speed of all. Emissions are measured in grams per km, so as long as you compare the same units then the time taken to travel the km does not effect the emissions per journey. Yes, if you put in speed bumps and then speed (illegally) between the bumps you will increase the emissions. Hence you get smoother driving and lower emissions without speed bumps. That’s why interventions such as speed bumps are not the solution. Communicating with “hearts and minds” will beet doing so by “buttocks and spines”. More than trust perhaps. I have an honours degree in automobile engineering. Diesel emissions of NOx and PM10 are 10 times those for petrol cars. Hence reducing diesel emissions (imperial college estimated an 8% reduction ion a 20mph rather than 30mph real world cycle) makes a big difference. Of course anyone mode shifting from car to walking, cycling or public transport reduces their emissions by 100%. I take Rod’s scientific points on trust but I also agree with R Craven. I have on several occasions ‘neutralised’ the air quality benefit that pro 20 campaigners have put forward. My view is that it is unprovable either way in real world situations, so just take it out of the speed limit discussions altogether by assuming that speed change is neutral to air quality. Air quality is a public health matter, but a much bigger source of the problem is that some Euro 6 compliant cars are over 10 times more polluting than other Euro 6 compliant cars. RDE tailpipe emissions measures will slowly address this over the next couple of years as the latest new standards kick-in and become mandatory. Rod what you or rather the boffins have said is nothing new. You continue to fudge the issue. You have just confirmed that which many of us know about and that is to get to 30 mph a vehicle eats more fuel and therefore creates more harmful gasses. What you or they have not as yet done is answered my question. That is this. With a speed of 20 mph as opposed to 30 mph and at a constant, will a vehicle consume more or less fuel and will it give off a greater or lesser amount of harmful gasses? Further, whatever the results may be, will not a car travelling at that slower speed actually put out those amount of gasses over a longer period of time? Some half as long again in travelling over the same distances. Thus a slower speed may result in the same or indeed greater production of noxious gases? I know that within that there are variables such as gearing and revs at certain speeds and they will lead to many variables, perhaps too many to determine. So to keep it simple and keep a constant would simplify things. Further that if a 20 mph area requires road humps and cushions to make it viable, then surely that it would in general cause a driver to slow and then accelerate over them until the next one then that constant acceleration would or could as you mentioned in your reply cause an increase in gasses. Perhaps it would be less polluting if a vehicle were permitted to drive down that street without any passive obstructions at say the old 30 mph or similar and to keep at a more constant speed rather than jumping from one slower speed to another higher one? Perhaps? The arguments put forward by either side could be somewhat erroneous in about 5 years time as petrol and diesel cars are getting much better at eliminating the problem of noxious gasses. Further, there is the development of many more energy sourced vehicles such as electric and hydrogen to name a few that give off no noxious gasses at all. Therefore for the purpose of saving the planet then an overall 20 mph limit would be a useless waste of time and effort but then again it was never originally intended to be a tool for world survival but basically for the reduction of injuries to pedestrians. Rolling resistance and transmission friction are broadly linearly proportional to to speed. Air resistance is proportional to the square of speed. Potential energy is linearly proportional to the height gained. Kinetic Energy is proportional to the square of the speed gained. a) and b) are very similar for vehicles at 20mph or 30mph. c) is proportional to speed squared but is relatively low at 30mph or below. d) is not affected by the speed at which you climb a hill. That only affects the rate at which you use fuel per second, the total amount required to climb a given altitude will be similar regardless of speed. e) is the one that determines urban fuel consumption the most. Getting a vehicle to 30mph takes 2.25 times that to get to 20mph (ie 30×30 compared to 20×20). Given that in most urban setting there is repeated slowing down and often stopping for hazards, obstacles, congestion, lights, it is the repeated depletion (braking) and then acceleration to peak speed that uses most fuel. That is why a 20mph limit cycle will require less than half the energy than a 30mph limit cycle for acceleration. Whilst the sweet spot of the engine in terms of efficency may make a slight difference this is not significant. So, the mechanics and physics are quite clear. Smoother driving to a lower limit will always require less energy, less fuel and produce fewer emissions than repeatedly accelerating to a higher limit. If any vehicle needs half the time more to travel through a town centre or urban area with the subsequent increased exhaust pollution then that surely negates any atmospheric benefit from having it travel more slowly. As an example if a commercial lorry with a diesel engine requires about an hour to deliver to certain shops then its going to need at least another half hour on those roads at slower speeds. There are thousands of such journeys through urban areas made every day. What benefit do others get from this? When it comes to actual evidence that 20 mph works as yet from the last 12 years the jury is still out as not one authority has actual categorical, irrefutable proof that it is working. It’s all speculation, supposition and assumptions. Without a massive and prolonged police intervention as in Calderdale that is. I should have added that as 20 limits are the least complied with, then this is where Intelligent Speed Adaptation would be most beneficial. If the day ever comes when no traffic in urban areas exceeds 20 mph, then that will be something to rejoice. Here we go again: implying that the posting of lower speed limits will somehow result in less road casualties, lower air pollution levels and a safer and more pleasant road environment! For that to work we would need some kind of magic new speed limits that have a positive and significant effect on traffic speeds – and we know that they haven’t been invented yet. What we *actually* need is the introduction of practical and realistic measures which are known to deliver safe and appropriate traffic speeds and to stop kidding ourselves that speed limits have any role in achieving this objective. Deciding which roads (if any) are to remain as 30 in an otherwise 20 area, will again be the sticking point. Rather than try and decide at the outset which roads are to remain as 30 and risk a hotchpotch mix of sometimes irrational 20s and 30s, why not make all the urban roads 20 with no exemptions and simply wait and see what happens? For the motorist, there will be no doubt that when they are in an urban area – town or city – the limit will always be 20 – less signage for one thing. As things progress, it may easier to decide which roads, if any, could be 30. The other sticking point of course is compliance. The campaign by Mark Ruskell MSP was previously reported in an RSGB article on 26 June 2017. It is interesting to re-read the comments posted back then. I suspect that not much has changed in people’s opinion on both sides of the divide. Come on DfT, where is that Atkins 20s report – its a very long time in the making.